Here comes another improvisational jewel of an album from Dutchman Mike del Ferro, whose piano keys, heart, and well-versed skills combine traditional South African sounds with electronic wizardry of fellow band members, all South African. Challenge Records is offering this third album, “The Johannesburg Sessions”, as part of a 10-album series that present del Ferro’s “songs inspired by wandering the globe”. His South African experience of absorbing local jazz sounds, rural and urban rhythms, and musings with traditional healers has produced another magically enlightening study in sound. Like his recent workshop “Working in Sound” at the March 2015 SAJE conference (South African Association for Jazz Education), del Ferro explores how electronic effects open up avenues for compositions which wed the traditional human and animal sounds with contemporary improvisation. More about that later. The album is filled with Zulu and Xhosa vocal chants (from Zulu singer Mbuso Khoza) mixed with electronica of bassist/composer Carlo Mombelli, and punctuated with African rhythmic sounds of drummer Kesivan Naidoo and percussionist Thebe Lipere. It opens with a lilting Zulu song, “Smomondiya”, about a beautiful Zulu woman. One hears Khoza’s falsetto voice enamoured with her image. “Ntylo Ntylo” followed by “Goema on Saturday” ring familiar to the local popular song and Cape rhythms. Naidoo kicks off in characteristic goema style with del Ferro’s piano chords and phrases and Khoza’s vocal chants announcing the joyful street dances and parades reminiscent of the January Cape Carnival. “Umlolozelo” is an absolutely beautiful traditional Zulu ballad, presented skilfully by Khoza’s gentle and wide soprano voice range as is his other slow ballad, “Imbusise” meaning ‘Lord bless the work of my hands’. An interesting 12/8 improvisation is “Twelfish” with familiar worldly percussive effects but fundamentally African. The final songs feature Khoza’s tributes to his cultural kingdoms of old, of the late 1870s Zulu King Cetshwayo’s reign with original scores by del Ferro in “Leyla” and “Mpushini”, which is a melodic del Ferro song with Khoza spoken lyrics about the river that runs next to his native village in KZN. It ends the album on a meditative note. My favourite on the album comes in the middle: “The Mosquito Loop” is fun. The mozzie buzz is always there, glittering with the electronic effects of bassist Mombelli playing with his pedals as he enjoys doing. There is something ‘traditional’ (in keeping with the album’s otherwise African sounds) about the ever-present and monotonous mosquito buzz as the piano echoes in short phrases as the percussion taps out energy and the drum rolls crescendo (Naidoo’s signature method) just as the mozzie lands. The psychedelic electronica merges as mozzie flies away happy! This is a fascinating study in pedal loop improvisation – just make sure your stereophonic range is well tuned. I can’t wait to hear the subsequent 7 albums yet to come in this 10-part masterful series of global sounds. Del Ferro is also a master of improvisation workshops as exhibited in several ‘shops’ I attended in March. 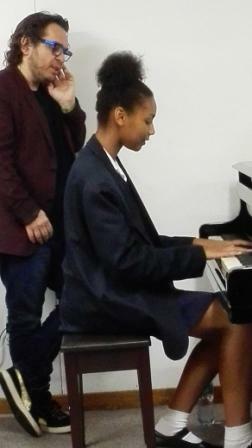 Nobuhle Mazinyane, a 16 year old Grade 11 student at Groote Schuur High School, played her own composition at Mike’s workshop “Working in Sound” on 30 March 2015. Mike del Ferro’s dizzying schedule of ‘wandering the globe’ can be seen on his website, www.mikedelferro.com, along with a multitude of video clips that offer armchair travelers an array of those globalized sounds ala Mike.